A damaged and incomplete cast copper-alloy mount, possibly a propeller shaped belt stiffener of late Roman date. The mount consists of a central circular element (diameter 16.4mm) flanked to one side by a sub-rectangular tab. There is a transverse break at the circumference of the roundel where a possible equivalent tab might have emerged. The roundel is decorated with longitudinal ridges, those towards the edge curved to follow its shape. The grooves between are decorated with incised rocker arm. The tab begins with a transverse ridge, beyond which the main field has two longitudinal ridges within an edge border. Towards the terminal of the tab is a square zone with central perforation; no rivet survives. Beyond the square is a succession of short transverse ridges. The mount has a variable mid-green patina over a red/brown metal. The tab's terminal has been bent down slightly. If it is indeed a Roman propeller mount, such belt mounts were used transversely on belts to stiffen and decorate them (Geake 2001, 33). These mounts cross over from the late Roman period into the early Anglo-Saxon period. 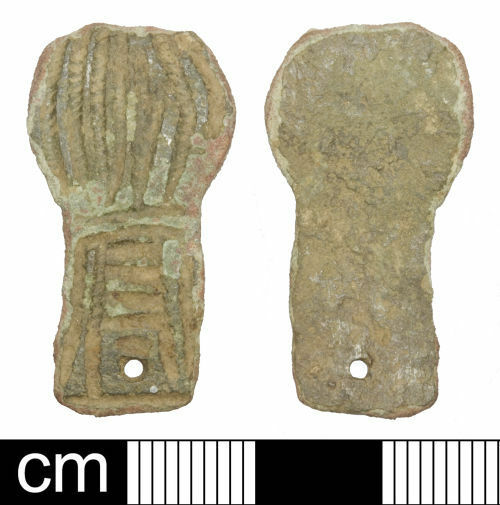 It is noted that medieval bar mounts operated in the same way and a later date cannot be ruled out for the artefact.